As of mom of toddlers for the last 13 years I have come across some pretty neat things. There are always those items that come along and you say,"why didn't they have that when I was pregnant or when my baby was little." I would like to share one of those finds with you. 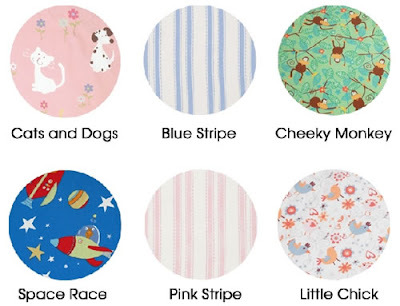 I have Space Race, Cats and Dogs and Cheeky Monkey in stock at my store. Stop by to see them for yourself. grobag® first duvet bedding set is an all in one duvet cover, bottom sheet and pillowcase set, that has been cleverly designed to make it easier for your little one to move from a cot to a first bed. If your little one is about to make the transition from a grobag® baby sleeping bag to duvets and sheets, then this is the perfect solution. The ingenious design of the grobag® first duvet bedding sets means they'll have the safety and security of a baby sleeping bag without the fear of them falling out of bed or pillows going over their heads.With the grobag® first duvet bedding set, the cover can be securely attached to the fitted bottom sheet using a zip system on both sides, so it's easy for your little one's to get into bed, but you'll have the peace of mind that they can't fall out! Plus the pillowcase is also attached to the bottom sheet - eliminating the risk of it going over their head in the night. The grobag® first duvet is available to complement the bedding sets, with the added benefit of 2 top corner poppers the duvet and covers can popper together meaning changing is easier and duvets slipping down inside the covers will be a thing of the past! The toddler bed size is available in a 4 tog option, which is the maximum tog rating for this size of bed. Integral poppers system to clip duvet and bedding set together at the top for easier bedding changes and to prevent duvet slipping down inside covers.